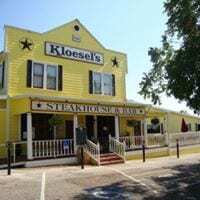 Harvey and Diana would like to welcome you to Kloesel’s Steakhouse, the perfect place to enjoy a great meal in a historic setting. We serve only premium cuts of aged beef, which Harvey personally selects, cuts trims and cooks to perfection. We also serve a variety of pastas, seafood and chicken dishes. When you visit, don’t forget to check the board specials of the day. A homemade lunch plate special is served daily. We also have homemade pies, a variety of cheesecakes and other delicious desserts. Are you looking for a place to have a great time? Well then, Kloesel’s Bar is the place. From whiskey to beer to wine…we have it all! Our bar is perfect for your nightly, weekly or monthly gathering of friends. It’s also great for celebrating a girls or guys night out. On Wednesday we have drink specials and free food, and on Thursdays come join us for half priced bottles of wine!